This is a gorgeous look for girls designed in Italy by the famous Dolce & Gabbana fashion house. 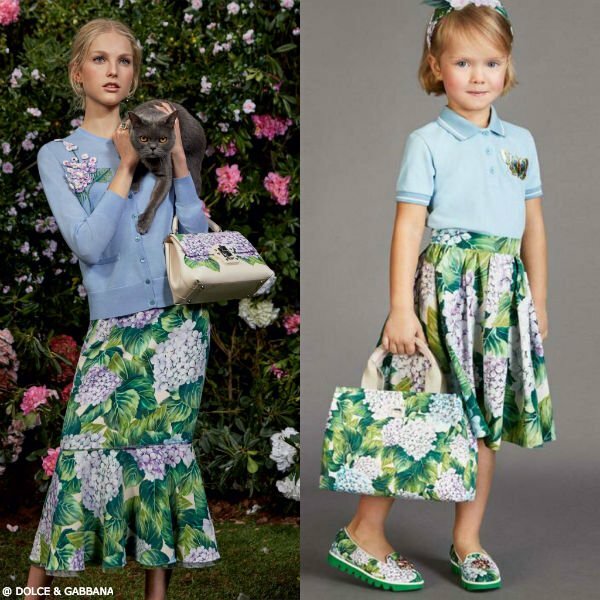 Inspired by the Dolce & Gabbana Women's Fall Winter 2017 Collection this DOLCE & GABBANA Girls Ortensia Cotton Skirt The perfect skirt features a gorgeous mini-me blue and purple hydrangea print. Would look great with a light blue polo shirt or a matching DOLCE & GABBANA Girls 'Ortensia' Cotton Blouse with its blue and purple hydrangea print and pretty ruffles and gathering on the back adding an extra girly look to this pretty top. Complete the look with a DOLCE & GABBANA Girls 'Ortensia' Canvas Bag and matching hydrangea print sandals.